We installed a house full of vinyl windows for a client last year in her rental home, and she called me again to take a look at her personal residence. She had two huge steel casement windows in her living room, and two older wood windows in her kitchen that she wanted to change. Initially, she had just wanted us to install vinyl windows in her home. 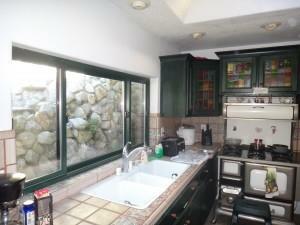 Her primary concern was energy efficiency, and the old windows were not closing and locking correctly. However, after a few discussions she realized that the white color of the vinyl would not go with her home. Outside, the windows are all dark bronze, which is nearly black in color. She is in the Carbon Canyon area of Chino Hills. It is very hilly, and is surrounded by natural beauty. Her primary concern was that the white exterior of vinyl would not blend in with the natural surroundings nearly as well as the dark bronze. And while we could have painted the outside of the vinyl windows, we cannot paint the interior of vinyl windows. This led us to discuss the use of fiberglass windows. 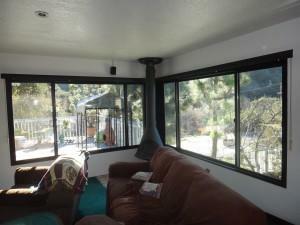 Painting the interior of our fiberglass windows gave us the flexibility to match the existing decor. On the inside, the windows in the living room were also dark bronze inside, while the kitchen windows were a really pretty shade of green. These colors weren’t an accident, either. In the living room, she has a gorgeous pot-belly stove in the corner, and it is matte black. She also has metal horizontal blinds painted flat black. These are custom, and needed to be metal because of the proximity of the stove to the windows. And frankly, there might have been cause for concern with the vinyl windows being so close to the stove also. They may have warped from the heat. In the kitchen, all of her cabinetry is a very pretty green. She likes the color so much, that she even had a few pieces of furniture in the adjoining dining room painted the same color. So she wanted the windows painted to match. She didn’t have the name of the color she used for the cabinets and furniture, as it had been years since she had the paintwork done. And there was nothing small enough to take so we could color match. So I ended up cutting a piece of inside of the old window off (since they were going in the trash anyway), and used that. I couldn’t believe how well it turned out! It was amazing, a dead match! All in all, this install turned out amazing! It is another really great example of how fiberglass windows can fill a custom niche for a homeowner who doesn’t think vinyl will look right in their home. That being said, vinyl works amazingly in a wide spectrum of homes. But in this case, I have to agree with the homeowner. This was definitely the right call.